There is a large body of research that centers on the detrimental effects of hot weather on horses. As horses are worked, heat builds up naturally inside their bodies. Normally, this heat is expelled through sweat or panting allowing horses to quickly recover lost fluids. However, when excessive heat from outdoor temperatures are added into the mix, there can be significant negative effects. According to a study done by researchers at the University of Minnesota, a horse that is working hard in a hot environment can lose 2 to 4 gallons of sweat per hour. Horses in these conditions can suffer from extreme dehydration, which leads to irregular heart rhythms as well as acid-base and electrolyte abnormalities, all of which can be life threatening. When horses are too hot, they may also refuse food, which leads to further health problems. Working horses in high temperatures is risky. However, high temperatures outside can also drive temperatures inside of stables or arenas to extreme levels, leading to dangerous conditions for horses even when idle. Heat stroke, or hyperthermia, can happen very quickly and may occur when horses are kept in shelters without proper cooling. Heat stroke can lead to increased pulse rate, high fever, respiratory difficulties, seizures, or even death. Many horse owners enjoy their horses in competitive events, either individual or team competitions, and dealing with weather conditions is unpredictable. When horses are ridden or jumped during hot weather, they can overheat very easily. Although these horses are typically in top shape, riding too long in hot weather can build up excess heat in their muscles, which can be dangerous, at a minimum affecting performance. Returning them to hot stables that don’t have adequate cooling mechanisms in place can simply compound heat related issues and not provide the horse any relief from the heat. Horse breeders face even more significant hurdles. Exposure to heat negatively effects equine production by disrupting the normal reproductive process. These effects can have significant financial impact on breeding operations who depend on consistency. 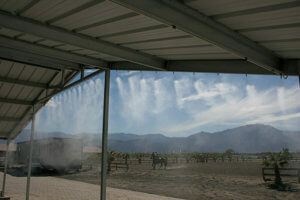 In stables or other equine facilities, in arenas or outdoors, a misting system can be a very effective means to combat the effects of heat stress in horses.